The acquisition of HydroTrack allows HydroWorx to offer an even more compact aquatic therapy solution. 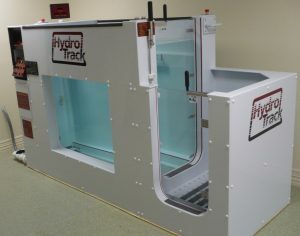 This opens up the opportunity for facilities with smaller space requirements to utilize the advantages of hydrotherapy. This acquisition makes HydroWorx solutions significantly more accessible to schools, physical therapy clinics, senior living centers, hospitals and fitness clubs. HydroTrack, formerly based in Phoenix, Arizona, was founded by Raymond, Rodney and Connie Crandell in 1990 and has been serving sports, senior living, physical therapy, fitness and veterinarian clients for 23 years. HydroTrack is manufactured by Conray Incorporated, a name derived from the start of its founders first names. All Hydro Track customer service and sales inquiries can now be directed to the HydroWorx Customer Call Center at (800) 753-9633. Existing HydroTrack customers will be proactively contacted by HydroWorx to ensure proper administration of all service needs. Learn more about the HydroWorx product line.